Knee replacement surgery has undergone significant improvement over the course of the last 20 years. Most knee conditions can be successfully treated with either medication or physical therapy, but when such treatments fail to eliminate pain and restore knee function, surgery may be necessary. Establishing a conclusive diagnosis with X-rays, MRIs and additional tests is the first step in treating any knee condition. Dr. James Grimes is our total knee specialist at Orthopaedic Associates of St. Augustine and he is an expert in diagnosing knee complications and identifying the proper course of treatment. With advancing technology and studies involving joint biomechanics it has been determined that a patient’s hip – knee – ankle axis is extremely important. Previously the primary focus would be on a patient’s single joint such as the knee in order to improve its muscular balance and control. However we now recognize that the entire hip – knee – ankle axis is crucial to proper joint function. Treatment for a specific joint now involves treatment of at least the joint above and the joint below to encourage an appropriate strengthening program. When strengthening the muscles around the knee, it is important to have hip external rotator strength as well as a 60% hamstring to quadriceps ratio for optimal balance. The knee is one of the most commonly injured joints as the muscles, ligaments, tendons, bones, and cartilage are all at risk for trauma and natural wear and tear. Once a patient’s ligaments, tendons and bones heal after surgery, such as a knee replacement, rehabilitation of the muscles become the primary focus. Muscular balance is very important for a well-functioning knee. An injury can upset that balance and unless the problem is fixed it can lead to accelerated wear and tear on the knee joint. A mechanical problem within the knee sometimes requires surgical intervention through arthroscopy, which uses a small camera through an incision to perform surgery. An arthroscope allows a clear view of the cartilage and internal ligaments so that the knee can be repaired without invasive surgery. As a result recovery time is reduced significantly. 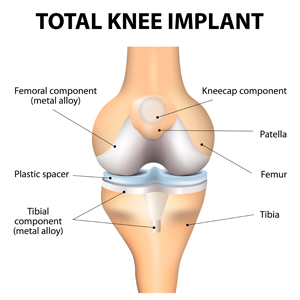 A knee replacement is recommended when the cartilage has worn out. Minimally invasive surgery is performed under computer navigation to improve the alignment and balance of the knee joint. Knee replacement surgery typically takes about 45 minutes to complete because of high efficiency and our dedicated orthopaedic team. At Orthopaedic Associates of St. Augustine knee surgeries are performed with minimally invasive tissue sparing techniques, allowing patients to begin walking the same day of surgery. If you’re experiencing knee pain or suddenly had an injury and need to be evaluated, we encourage patients to request an appointment online. For more information contact us at 904-825-0540.